The weather, oh the weather. The reason we British talk about the weather to the extent that such discussions are a national pastime is because our weather Does Things. A couple of years ago, I was at a multi-period event in the South-East of England, a regular fixture in our calendar. We put on a battle display every day of the three-day event, and on the Saturday, we formed up and marched down to the battlefield. In the pouring rain. 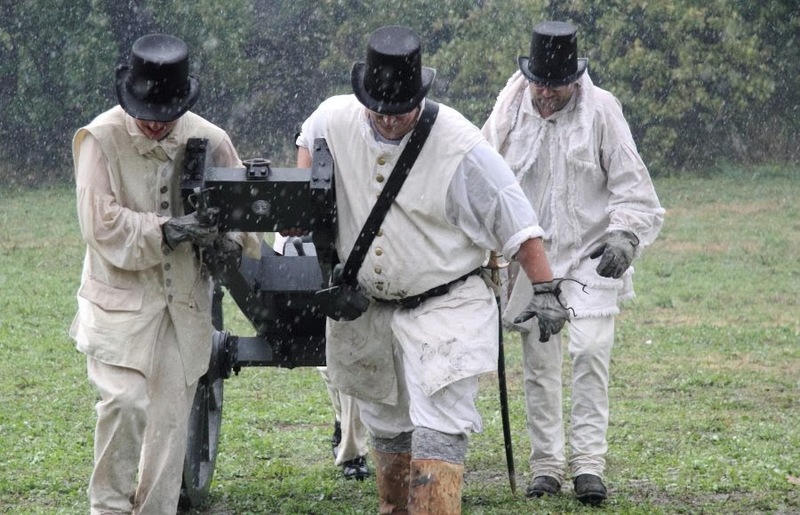 We attempted to load and fire our muskets... in the pouring rain. We finally gave up after about three muskets fired in fifteen minutes on the British side, with nobody wishing to die in the muddiest battlefield I've ever seen, and formed up to march back to camp in woollen jackets that weighed about twice as much as normal. The handful of spectators who had braved the weather didn't blame us for giving up, either. Note: It always rains at least one day of the Military Odyssey at Detling! #2 is my personal pet peeve... especially when paired with the subject of "authenticity." That can lead to some realy bad blood. Weather... well the worst weather makes the best stories... you know at some other comfortable event around a campfire. Mine is the bathroom situation. I purposefully try not to drink so as to limit my visits to the "Blue Springs". Cliques almost never go away. This is a sad fact of the real world. Undergrad, Graduate school, careers... all the jobs I've held had cliques, with members ranging from early 20s to late 50s or so. It seems to be an inherent human trait to want to include the few and exclude the many. 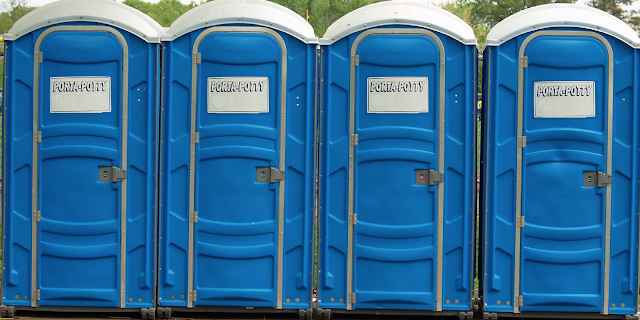 Port-a-johns are my bane, but I hate using the woods worse than using the blue boxes. Here's an amusing story for you. We were tipi camping in the sticks, in period clothing, and the landowner requested us to use port-a-johns (which was reasonable, seeing as how there were about fifty of us in a smallish area). It was late in the event, and my tipi mates and I were down to the last roll of stashed toilet tissue. I took our last roll, and was warned by one of my friends to not drop it down the hole. Scene change, to inside the blue box... after doing the necessary, I was getting ready to get up and leave when I dropped the roll down the hole. I still had the end in my hand, so I kept grabbing the paper and pulling it up to save it, and the roll itself just spun, unwinding, above the nightsoil. In the end, I rescued the paper and took it back to the tipi in its unorganized state, announcing, "Well, I saved the important part!" I do so enjoy all that the good Doctor has done and said in the past, if fact he is why I gave up my 18th century practice, although I do reserve the right to my title of 'Doc" I had always wished that a younger, stronger and handsomer man would succeed me in this endeavor and indeed an even smarter one has! Having said that, I do remember being pressed into the service while at The Locust Grove and to that end I am now in the process of obtaining a 1780 British Sea Service smooth bore pistol! I don't get why some port a pots have no hook inside the door. Do they assume that no one using it will have a bag, backpack, jacket or cloak that they would like to hang up out of the way? 7. don't take so much stuff. on campaign, you carried little. 6. Whether the weather be cold, or whether the weather be hot, whatever the weather we whether the weather, whether we like it or not. 5. No such thing as a stupid question. Questions are requests for interaction...they may seem silly but you cannot sit in your own little world when you are at an event for the public. 4. Stick to local events or carpool. 2. Cliques are real...this I will agree on. But bringing yourself to the level of childishness you witness makes you no better. 1. Use a chamber pot. 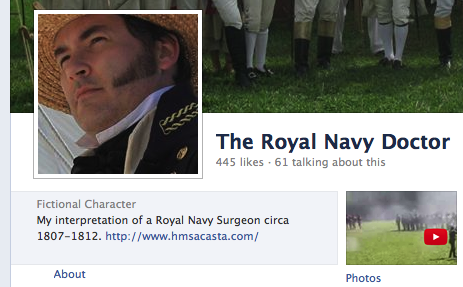 Wow...this entire post is embarassing to reenactors. Did you ever think that maybe they were speaking tongue in cheek when they wrote the article? Yet they are having the time of their lives doing what they are doing. You sound like one of the cliques I would stay away from because you have no fun. Ms. Hackabout couldn't have echoed my sentiments better. Reenacting is an amazing hobby that we are all privileged to participate in. If we go looking for problems, then problems we wil find. Instead consider each difficulty a chance to learn, problem solve & experience, for those brief few days, what life was really like for those who came before us. Yes Widow Black, I agree that our hobby is awesome. It is with tongue firmly planted in cheek that I offer up this list. Thanks Barbara, I'll take your opinions under advisement. Even *one* of these things would be enough to scare off a non-reenactor. Add them all together and I can come to only one conclusion - we must be crazy! :D This, after your Seven Stupid Questions, is one of my favorite posts. Oh, the packing/unpacking for an event is the bane of my reenacting life. When you have only one car in the unit, and that is a three-door Vauxhall Corsa, and you are trying to get get eight persons (some of whom are foreign members) to an event with enough tentage to house them all, all your personal kit, not to mention theirs, not to mention food... ARGH. Even doing nice little local events becomes a nightmare at times like that. 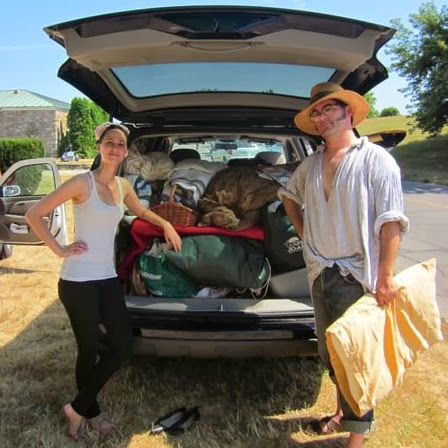 I still don't know how I made it home in one trip - yes, we did have a couple of other vehicles, but my car was still crammed to the roof with uniform and all the miscellaneous bits of camp equipment that other people couldn't/wouldn't take. I had no idea it was possible to get that much into one small car! I think that you have summed this up perfectly. As a woman who has also done Civil War period reenacting, porta potties are awful...especially navigating a hoop. Regency isn't anywhere as bad...but oh the smell on a warm day! My other bane has to be critters and insects..mosquitoes in particular...they seem to know when I have arrived in camp and then pursue me all weekend until I am blotchy all over (repellents don't work on me!). I am terrified of the smallest spider..so fellow reenactors know that one yell from me they come running to swat them. and "Rain, rain go away, come again another day,"...not when I am off to camp. I don't believe I ever told you guys about the event I was at - a multi-period one - where our battle was basically rained off? it had been perfectly fine that morning as we got into kit. It started raining as we formed up, rained harder as we marched down to the battlefield and was a complete deluge by the time we were ready to have our battle. Of all the muskets on the field, I think there was a grand total of three - English and French combined! - that fired. We had about forty minutes to do our battle and gave up after ten. And we got back to camp and the rain stopped and the sun came out! 7. Packing. I live in a smalk, upstairs apartment, so while packing can be a pain, UNpackinh is even more of a task. 6.Weather: many years ago, I did an event in a constant drizzke: the roads were a 3-inch mass of mud, and everyone was getting frustrated with soggy shoes and stockings. I found that by going barefoot, I had a thick, insulating coat of mud, instead of wet footwear. 3.Diet. with one of my units, sausage, sausage, and more sausage. Although, sometimes a nembef WILL do up something special. Still, taking time away from a large crowd at a complex presentation, can be tricky. 2. Cliques. I try to not be cliquish, but I'd rather pull my own teeth with a Godwin tooth extractor, than go back to Civil War, because there are so many people still bickering about the politics of a war that ended 150 years ago. If tgat's being cliquish, then I guess I'm guilty! 1. 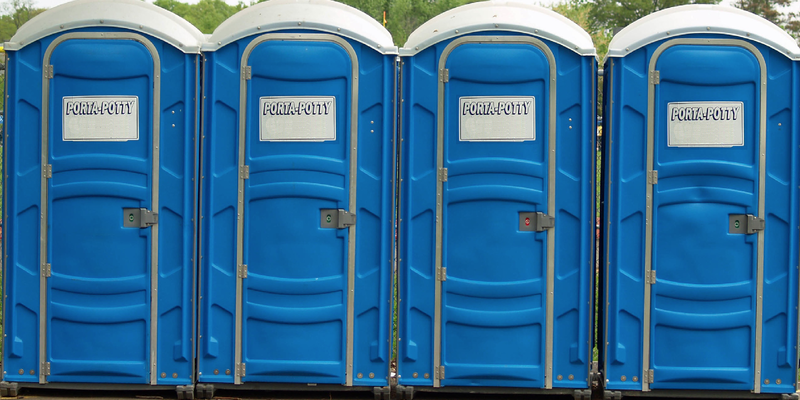 Port-a-pots. Few have hooks for cartridge boxes, sword belts, coats, waistcoats, etc. Sometimes I wish comoanies would set up soecial "reenactor models": handicap models with a built-in wardrobe rack! Still, while these things can be a bit frustrating, if I didn't think it was worth all that, I wouldn't keep doing it. Good post, and while I would never discuss tgese issues with the publuc, at an event, it sonetimes helps to "comiserate" with other reenactors. we actually made a set of hooks we could hang inside them and leave till the end, and stake outside(pending good weather) for guys to be able to hang there stuff for the port-jons usage. was always the number one complement we get for such a simple thing, but it is handy to have! After several minutes of completeing your transaction in the blue booth from hell, you begin to realize that the aforementioned photographic device can only be in one place. You have 5 seconds to decide...Do I let it go? Or do I go after it? Yes, the pictures were shite. Being a native reenactor (Seminole/Mvskoke), I've found it's easier to just strip to my long shirt, Lin cloth, and leggings before taking "the walk". Gives a but of a show to the public - they get to see a bit of what goes into getting ready each day. But yes. To all of these things, yes. Dealt with them all at some point. Number 7 has never been a problem. As mu impression is either an American Civil War Federal infantryman or a WWII Heer Infantryman everything I need I try to carry in on my person including my three days rations in my haversack / breadbag. As a multi-period reenactor (dominately 13th century English knight) , I have experienced all of these. But, at least in my Victorian and Early American kits, I can fit into the porti-johns. That isn't always the case when in armor. True akwardness is trying to use the bathroom in full fight kit. It is compounded when your pauldrons are touching the walls so you have to back in blind. Having no room to turn around has resulted in at least a couple dipped surcotes. Worst weekend ever.